No artist captures the spirit of Cinquecento Venice with more splendour than Veronese, especially in his Biblical feast scenes: large canvases full of light, colour and vivacious figures set in a theatrical architectural space. Significantly, as pointed out by the Venetian writer Barbara Zolezzi, Veronese’s articulation of the everyday with religious themes corresponded to the Serenissima’s symbolic vision of Venice itself as a harmonious balance between the sacred and the profane with humanity at the centre. Veronese, however – famous for not allowing the patron’s will to override his artistic freedom – went too far. Cena in casa di Levi (1573) began life as a commission for a Last Supper for the Santi Giovanni and Paolo monastery. Aside from the rich and famous, the artist includes Africans, todeschi, servants, dwarfs, clowns, drunks, militia, dogs and cats, amongst others. Women are absent from the feast, although the dog in the foreground may once have been Mary Magdalene. All are interconnected through a relay of gestures and glances. However, the holy fathers objected to – amongst other things – the ‘irreverent’ depiction of a disciple picking his teeth and an African seated next to Christ; and not for the first time, Veronese was brought before the Inquisition charged with heresy. In answer to a question concerning the African, Veronese tells the court: ‘The Moor is there to chromatically emphasise the figure of Christ, and to express the most important concept of Christ, that of equality between men.’ In the end, the artist was obliged to paint over the African and re-title the painting. Despite the limitations of his time, I see Veronese’s expansive vision as relevant to our time: a belief in the connectedness and equality of humanity, irrespective of race, ethnicity or class. Nothing presents this conviviality better than a feast. And nothing conveys so succinctly the spiritual and political dimension of Veronese’s poetics. When I think of Veronese’s painting I’m reminded of what was special about Venice when it was a city relatively independent of Papal authority and nationalistic identities or agendas: its character as a cosmopolitan crossroad of diverse cultures and peoples, exchanging goods, languages and ideas; and its aspiration – if not always realised – towards hospitality, freedom, justice and equality, even if some foreigners were domiciled in ghettoes. A transcultural place inscribed with the traces of multiple narratives and histories; an agonistic space actively engaged in the production of cultural meanings. 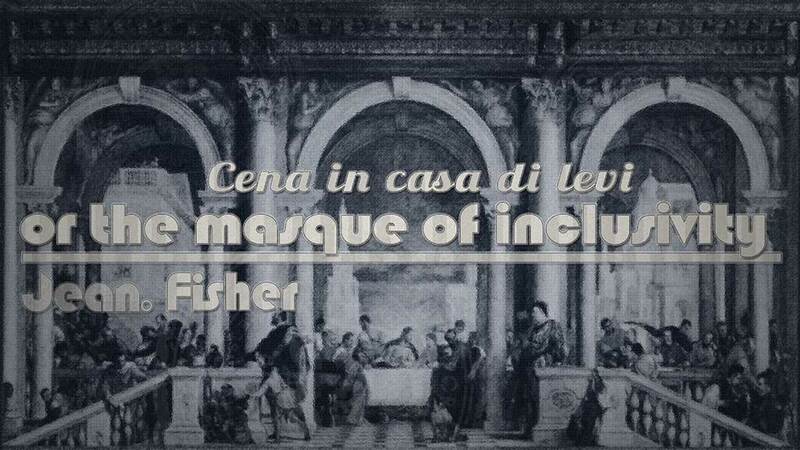 What progress have we made towards Veronese’s idea of inclusivity? Our intervening centuries have been dominated by a European technocratic vision, which, with the complicity of Church and state, and under the rhetoric of universal emancipation and modernisation, reduced so many peoples to an inhumanity deprived of political agency. Global corporatism strikes many of us as yet another phase of imperialism, more terrible because it no longer has a human face. And perhaps not paradoxically, an alienating disempowerment has intensified xenophobic fundamentalisms and nationalisms, making it ever more difficult to establish the ground for a conversation. Genuine cosmopolitanism – not to be understood as yet another Eurocentric universalism, but as respect for and exchange with difference – seems to be an ever-receding dream. Multiculturalism, as a grudgingly tolerated co-existence, is by no means the same thing. Moreover, the notion that communications technologies now connect us all equally is a fallacy of power. My colleague Gerardo Mosquera has eloquently spoken of the reality where ‘connections only happen within a radial and hegemonic pattern around the centres of power, where the peripheral countries (most of the world) are disconnected from one another, or are only connected indirectly via – and under the control of – the centres.’ (in Mosquera, ‘Some Problems of Transcultural Curating’). This set-up produces what he so aptly calls ‘zones of silence’: peoples in territories locked out of international fair trade and conversations. It is not that they don’t know what is happening, or have nothing to say, but that no one is listening. The internationalisation of the art world has not meant open inclusivity, but selective inclusion governed by the vested interests of the market, often in collusion with national agendas. The past twenty years demonstrated that the inclusion of so-called ‘minority’ artists into the mainstream art system was a double-edged sword. To extrapolate from Derrida commenting on the ‘laws of hospitality’, to wish to be included implies acceptance of the authority of the ‘host’ and submission to the terms on which the host makes inclusion possible – a subtle form of subjection and control. But if there is only one legitimising system, then compromises must be made. And the compromise that ‘minority’ artists often had to make was to sacrifice artistic freedom or critical discourse to market fashions for ethnic exoticism. Derrida also notes, however, that the stranger ‘liberates the power of his host’, and in this sense the host becomes ‘hostage’ to the guest. ( see Jacques Derrida, Of Hospitality, Stanford: Stanford University Press, 2000, pp 121-127). One cannot transform a system only from the outside. Hence, this ‘assimilationist’ tendency did form a breach in the wall even if it didn’t have much of a qualitative impact on the overall structure. And it has since given way to another phase: no longer the presentation of signs of difference, but – as Mosquera has also intimated – a speaking from the place of difference: critical subjective positionings relative to global narratives that involve us all beyond national borders. Has this shift affected the mainstream? Undoubtedly, market interests will always tend to bind us to the old solipsistic artist-hero and a studio-based art imagined as divorced from everyday life. If the international credibility of an artist remains contingent upon product endorsement by a private gallery or star curator, then this continues to lock out the unconnected. As also do public museums that have surrendered their independence to the private sector, whose economic support of public spaces means it has greater leverage to control – and repress – aesthetic and critical debate. Do the merchants and moneylenders now firmly occupy the temple? Or, to use another analogy, has Plato finally had his wish, and the poet – that irritant and destabilising voice – is now banished from the city? Well, artists are not so readily silenced; the institution is not the actual site of art; and counter-narratives traverse the entire field of art. Global contradictions – belonging and un-belonging, connected and disconnected, traditional and technological, extreme wealth and abject poverty, to name a few – have presented a new set of challenges, to which previously ‘marginalised’ constituencies or regions of the world have responded with new biennales, spaces, networks and collaborations that may, or may not, involve mainstream circuits. Despite fears that this means cultural homogenisation under the universal sign of hegemonic values, it may be premature to dismiss all these initiatives as straightforward imitations of Western structures seeking to join the club. All roads may not lead to and from Rome – or Venice. As Michel Serres notes, beyond differences, what is universal to humans is the desire for exchange – the development of networks of circulation and communication for the translation and diffusion of concepts and experiences. (in Hermes: Literature, Science, Philosophy, Josué V. Harari and David Bell (eds), Baltimore and London: Johns Hopkins University Press, 1983, pxiii.) Artists (almost!) everywhere now know the lingua franca of international art, but it can be spoken through a situated space of knowledge in negotiation with the global. We may therefore be looking at moves towards localised reclamations of aesthetic and political agency. Serres also notes that, in fact, there is no smooth passage between the local and the global. There are rather ‘islands, sown in archipelagos on the noisy, poorly-understood disorder of the sea’, between which messages are not seamlessly relayed but undergo displacement, distortion, resemanticisation. In a world of flux, the continuous production of difference is the norm not the exception. One might then focus less on sites of ‘communication’ as points of transmission and reception, and more on vectors of ‘mediation’ that open up new pathways and meanings between them, and through which language may be recycled to imagine new social narratives. Hence, some of these other initiatives may be vectors of counter-narratives deriving from a locally informed hermeneutics of globalism. Or even from what Michel de Certeau described as a subterranean economy: parallel networks and forms of exchange deemed worthless or negligible by technocracy because they are not readily reducible to its law. (in The Capture of Speech and Other Political Writings). An early example is Mosquera’s first editions of the Bienal de la Habana in the 1980s: experiments to connect trans-local ‘zones of silence’ along a South-South axis that radically departed from the Northern biennale format: no star curators or artists, no nationalistic or market-driven agendas. Rather the events were to provide a space for artists and intellectuals from peripheral localities to have a conversation about shared interests and experiences. And more recently, his collaborative curatorial project ciudadMULTIPLEcity in Panama City in 2003 – a topographical event which, against the tendency of large art shows to dominate and efface space, was an exploration and re-embodiment of the complex and fluid relationships within the space of one city and between its inhabitants and a few artists invited from ‘outside’. Like Veronese, Mosquera seems concerned to create situations that challenge institutional boundaries and carve out a space for genuine dialogue. The majority of artists survive through some form of subterranean economy. This is the ethos of the London Biennale. Founded in 1998 by the artist David Medalla, it is a do-it-yourself, free art event in which any artist can participate, from and in anywhere in the world, so long as they submit a signed and dated ‘Eros-arrow’ that connects them to the event and other participants. Information is exchanged by word of mouth and the website. Such artist-led initiatives have opened up circuits and sites of exchange increasingly concerned with expanded audiences and the re-siting of art between the ‘extraordinary in everyday life’, as Steve McQueen has put it, and the conditions of globally shared existence. Insofar as such initiatives often speak from the opportunistic life of the street rather than from any institutional base, their outcomes may be unpredictable and transient. In this sense they operate under the sign of the popular carnivalesque, or a guerrilla-like temporary occupation. Veronese’s painting draws on the carnivalesque to present a communion, or, in secular terms, a symposium. Common to both the carnivalesque and the symposium is the feast: the pretext for a convivial free discussion: speaking and listening. If Veronese’s painting remains heretical it’s because it is a symposium; it partially decentres the didactic authority of the Church and offers the stage to everyone, both inside and outside the picture – and the citizens of Venice would surely have recognised themselves within it. The ‘sites’ of art are first and foremost people, not places – are they not? This is how I understand artists’ renewed engagement with experiences beyond the studio, and the attempts by some institutions to cede their former role as consecrators of artistic value enshrined in fully realised products to the more unpredictable processes of ‘para-sitic’ encounters and gestures. In this way, the museum begins to function as a vector of experimentation rather than a communicator of pre-scripted messages. I appreciated Documenta 11’s effort to take critical Platforms to people in localities off the Euroamerican radar; Achille Bonito Oliva’s attempt to decentre the national pavilions in his Cardinal Points of Art in 1993; Fred Wilson’s research into African influences on Venetian art and design for his US pavilion in 2000; James Luna’s ‘Emendatio’ installation this year in Querini Stampalia, which drew on connections between his people and the Italian Catholic Church. But more such efforts in making connections are necessary before we can honestly claim that our symposia produce any consequence beyond pure rhetoric. My final comment returns to Mosquera’s ‘zones of silence’. A disproportionate number of peoples occupying these zones are indigenous – often described as ‘strangers in their own lands’, living under settler/colonial regimes that have historically allowed them little or no political agency or self-representation. Whilst these regimes have been quick to incorporate traditional cultural productions as their ‘national heritage’ (I’m thinking here particularly of Mexico, Canada, Australia and Israel), there has been poor acknowledgement or representation of contemporary indigenous art. I hope you will come and join in tomorrow’s discussion of some of the complex problems faced by indigenous art and artists, organised by the Smithsonian Museum of the American Indian.